CAS = kangaroo-court | Helping the best to get better! ← Strength training, transfer and wearable resistance. It isn’t often that I feel the urge to speak out, but as a wise man once said: “The only thing necessary for the triumph of evil is for good men to do nothing”. I decided at least to speak out in the faint hope that more people will speak out and things may change for the good. Unfortunately most people still speak act when a an general injustice has hit themselves. I have met a handful of coaches who never spoke out against this “war on doping”, or as a matter of fact, were supporters of it…….until their own athletes tested positive, a false positive of contamination case, that is. I came to this by two things, first of all, a former professional soccer player, who I used to help and now being retired, just riding mountain-bike for fun, tested positive for a proven contaminated supplement. Still WADA-CAS gave him a 4-year ban. Read more about this ridiculous case and you see where I come from. And this by far not the only case. Being interested in the human mind and spirit, I am just reading the book: Konrad Morgen: “The conscience of a Nazi Judge”, by Herlinde Pauer-Struder. 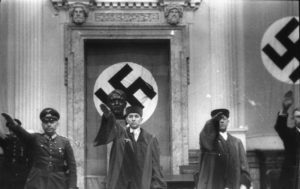 It is about a judge who calls himself a “justice fanatic”, but completely lost sight of it, and in his blindness was instrumental for horrific crimes, however completely legal under the Nazi regime. (Don’t forget that once, slavery, apartheid and the Holocaust were at the time and place where they took place, completely legal, thanks to the legal systems and the approval of the legal system) Interesting material to read and to realize that some people spare no effort to suppress or destroy any person, opposition, or thought, that conflicts with their own set of rules, beliefs, political stance, or convictions. It’s not only in Nazi Germany these things happened, also in de former Soviet-Union the legal system helped to suppress political opposition and assisted in murdering dissidents in fake trials. But then, history tends to repeat itself. In case of legal disagreement in sports, athletes have a possibility to turn to CAS, the court of arbitration, e.g. between the athlete and their national federation or the athlete and an international federation. That sounds good, doesn’t it? Well, it sounds good, but that doesn’t mean it is good. The last couple of years many athletes turned to CAS because of so-called positive doping tests or supposed contamination. Now this may sound as a logical and fair idea, but is just isn’t. Just take a look at the circumstances. CAS, which is supposed to act independent and take a neutral stance, is based just 5 minutes away from the IOC office, along the same road, in Lausanne. But more important is the board of the CAS, 80% of them are former employees or members of the IOC, FIFA, WADA, their national Olympic Committees, or anti-doping agencies. It is hard to believe these people will distance themselves from the policy of their former employers or will take a neutral stance. Many of them have just moved a few miles down the road. So, what do you mean, neutral and independent? I’ll say it bluntly: CAS is the lapdog of WADA, IOC and FIFA and they function like a kangaroo-court. A kangaroo-court is by definition held by a legitimate judicial authority, but they intentionally disregard the court’s legal or ethical obligations. The defendants in such courts are often denied access to legal representation and in some cases, proper defense. CAS is not there to protect the sport, or the athletes, it only there to protect the power and politics and the financial interests of the international sports organisations and the individuals running it. As an athlete you will never, ever stand a chance to win case of arbitration, no matter how strong or solid you case is. The numbers will prove this. An athlete trying to win a case against an organization like WADA at a CAS arbitration is as fair as lining up any CAS member in an Olympic 100 meter final and expecting him/her to win. They might, but only if all other competitors break their legs and doesn’t get up. So as an athlete, never waste your valuable time and money to take your case to CAS.